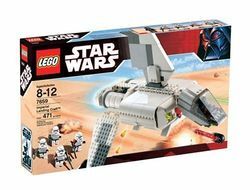 The set 7659 Imperial Landing Craft, also known as a Sentinel-Class Landing Craft, was released in 2007 as part of the Classic Star Wars line. Included are two Stormtroopers, two Sandtroopers and a TIE Pilot minifigures. The Imperial Landing Craft has a square-shaped main body that, at either side, can open up to deploy the stormtroopers it carries. There is a large, vertical stabilizing wing protruding from the center of the craft and two adjustable wings on either side that can move up and down simultaneously at the turn of a dial. These wings have full mobility, able to be move into a vertical position matching the "dorsal" wing. The cockpit protrudes out the front and is angled slightly downward. A TIE Pilot can be placed inside at the controls. Two blasters are located on both sides of the cockpit, with firing cannons next to them. These cannons appear to be small, as only the tip of the barrel is visible from the outside, but they are actually very large and can be fired from inside the stormtrooper holding area. That holding area can hold four stormtroopers and two extra blasters. "Bombs" can also be dropped from two places underneath the transport, making it equipped for battle as well as transport. The set has a similar design to the Sienar Fleet Systems (SFS) popular lambada design but is in fact their Sentinel-class landing craft. The Imperial Landing Craft was used by the Empire during the galactic Civil War to quickly and safely transport troops to designated hot-spots and battle points. It could carry over fifty Stormtroopers, twelve portable repeating blasters and several 74-7 Speeder Bikes. This is a description taken from LEGO.com. Please do not modify it. The Empire is coming in for a landing! Battle the forces of the Rebellion wherever they hide! Equipped with twin blaster cannons, “bombs,” a troop compartment and firing rockets, the Imperial Landing Craft is ready to deploy your forces anywhere in the galaxy. Gear system lets wings fold up together at the twist of a dial! Includes Imperial pilot, 2 Sandtrooper and 2 Stormtrooper minifigures with blasters. Facts about "7659 Imperial Landing Craft"
The Empire is coming in for a landing!